Technology, and particularly computing, is essential to family history. Without it, we could still tell family stories to our children, but we certainly couldn’t substantiate those stories from billions of historical records into millions of family trees, as web applications like FamilySearch and Ancestry.com do today. 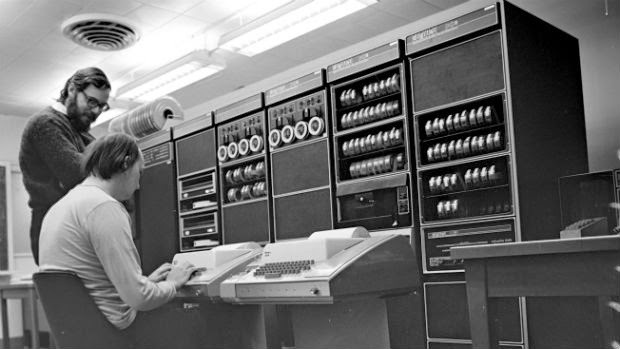 In the 1960s, Intel co-founder Gordon Moore observed that the ratio of computing capacity to cost was doubling predictably, every couple years or faster. In other words, a computer built in 1969 had twice as much capacity as a computer built at the same cost in 1968, and over a hundred times as much capacity as a computer built at the same cost in 1962; a computer built in 1969 would also reliably have half the capacity of a computer built at the same cost in 1970, and less than a hundredth the capacity of a computer built at the same cost in 1976. 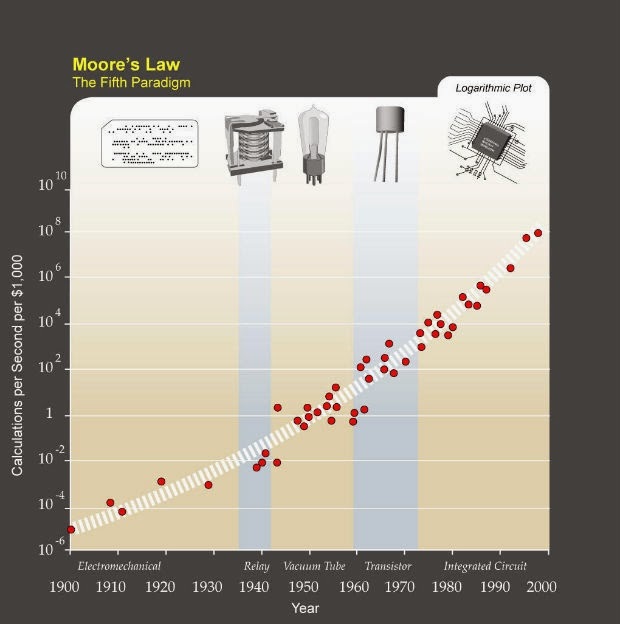 That trend, known as Moore’s Law, has continued to the present. Today, a $150 smartphone can store about a million times more data and process that data about a thousand times faster than the $150K Apollo Guidance Computer that took astronauts to the moon in 1969. The smartphone also has wireless access to extended computing capacity on the Internet, including powerful systems such as Google, Amazon, Facebook, Yahoo and eBay, as well as gigantic troves of family history data. Suppose Moore’s Law continues. Within decades, whatever replaces smartphones would have millions, billions and then trillions of times the overall computing capacity at the same cost. 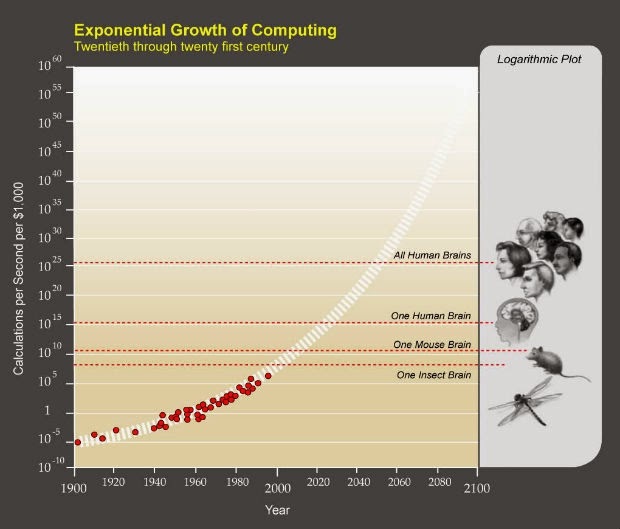 Within a century, $150 would purchase more computing capacity than that of all human brains combined. If that were to happen, what might the intersection of family history and technology look like? What might FamilySearch or Ancestry.com be like? Of course we don’t really know, but let’s imagine. One of the things we might do is tell stories about our family and ancestors at a much more massive scale and at a far deeper level, by computing highly detailed family history simulations. Maybe they would be something like a mix of Google Earth enhanced with a full history of maps derived from geological and astronomical research; Oculus Rift enhanced with brain-computer interfacing for an immersive tactile experience; and Second Life enhanced with avatars generated from family trees, photos, journals, and DNA, and abstracted to sub-neuronal degrees of detail to enable artificial intelligence. In deeper more meaningful ways, we could understand and even feel our family history, as the characters, settings, plots and conflicts unfold before us – as our stories come to life, and we walk in our ancestors’ shoes (literally?). As it turns out, if ever we compute such family history simulations, detailed to the point of enabling the characters with fully immersive consciousness, there would be a rather shocking philosophical ramification – more on that next time I post.